Samsung recently unveiled the long-awaited Galaxy Note 10.1 tablet. While the product itself is quite unique in terms of functionality and features, it truly highlights the reason for Samsung's struggles in gaining a foothold in the tablet market. Apple makes a healthy gross margin of ~40% on the 16GB versions of the iPad and over 50% for the 64GB versions. Since the iPad is an established brand in the market, consumers are more willing to shell out a premium for their products. It looks like Samsung is attempting to beat Apple at their own game. When you're a challenger in the market, you need to offer consumers better value for them to pick your product over that from an established brand. The smartphone market was a different game because the iPhone had a distribution disadvantage, which isn't the case in the tablet market. But even in smartphones, Samsung is much more diversified across price points, while they have very few low priced tablet offerings. Based on the chart above, Samsung could easily sell the Galaxy Note 10.1 for $100 lower than current prices, and still maintain roughly the same gross margins as the iPad. This would increase its market penetration and, in combination with the product's feature set, could boost word of mouth promotion as well. In addition to this, Samsung needs follow HTC's lead and focus on expanding its portfolio of low priced tablets, as that is where the market seems to be heading, particularly in Samsung's core emerging markets. Even Amazon seems to have abandoned plans for a 10-inch tablet for now, to focus on the 7-inch segment. 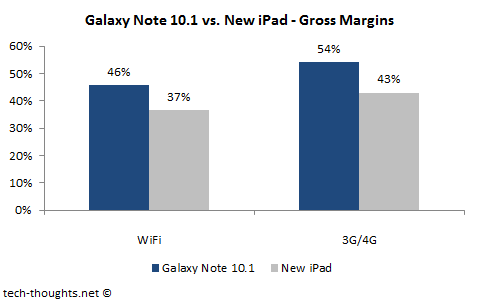 Conclusion - Samsung's struggles in the tablet market can be chalked up to a flawed pricing strategy. Samsung needs to follow Asus' lead, with more aggressive pricing, and focus on expanding its offerings at lower price points. Assuming that more people would buy it at 100 dollars lower. I feel like if you're willing to sell out the money for an iPad, a 100 dollar discount may not change many minds. Consumers at different income levels feel differently about purchases. One look at the ComScore tablet survey's income demographics will tell you that. Even within Apple products, releasing the older iPad 2 at a price $100 lower took away a lot of sales from the new iPad, even though it was a superior product. I'll have more in-depth analysis of that impact in a later post. 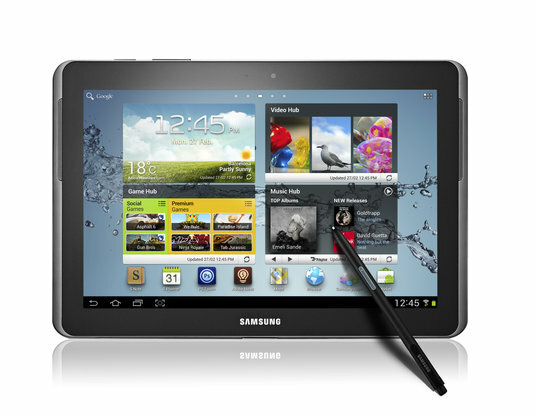 Samsung needs to have a range of tablets from INR 7,000 (~$120) to INR 50,000 (~$840). When smartphone market gets replaced by Google Glasses in next 3 to 10 years it is the tablets that will hold Samsung steady in that market transition. Interesting perspective. It is definitely possible that Google glasses and similar products could replace smartphones, but if there is a shift, I think it will be a more gradual transition (similar to today's mobile vs. PC battle). Initially, I expect smartphones to integrate with wearable computing devices.